Paris Children’s Dentistry is proud to offer different types of anesthesia to our patients to make their visits more comfortable. We are proud to be partnering with Sedadents Dental Anesthesiologist to provide general anesthesia for our patients. This is one of the many ways we strive to offer you the best care possible. General anesthesia is necessary in some cases to provide safe and effective treatment for children. 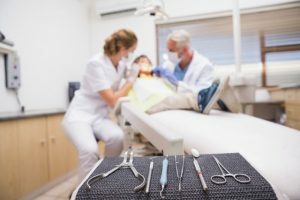 It is usually indicated for patients that are too young to comprehend dental treatment that require extensive work, patients who are extremely apprehensive and have very negative chairside behavior, or patients who have medical problems which dictate that treatment be performed in an hospital setting. Most children are able to be seen for an outpatient surgery appointment, have all their treatment completed in one visit, and go home the same day. Contact us today at (903) 905-4905 for more information about the types of anesthesia that we offer our clients or to schedule an appointment.